Dry Weight 7 - 8 Kgs. Power Supply 230 VAC, 50/60 Hz. Area Coverage More Than 16,000 Cubic. Fts. We are one of the trusted names engaged in offering a quality-assured range of NANOFOG series of ULV Foggers to the customers. These products are ULV foggers that are widely used for fogging water as well as oil based solutions, with utmost efficiency. 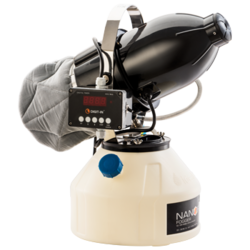 The highest number of features & highest area coverage as compared to any other conventional fogger in its category. High-density engineering plastic body to ensure portability & resist chemical attack. Since the supplied liquid is broken into very fine particles on the nozzle assembly itself and the aluminum body does not come in contact with the chemical, internal corrosion and chemical attack are avoided. The unit comes pre-fitted with a liquid flow control valve for ease of use. Fog output is controlled with this valve. Higher the volume of output, larger will be the fog particles and vice versa. Looking for Fumigation Machine ?